Split your players into pairs. Set up so that the players are standing 4 yards apart, either side of a three cone “barrier”. The aim is for the players to pass to each other over the cone barrier. They must use a good weight of pass and lean back slightly to lift the ball. You don’t want to see them kicking hard to get the lift. Players should alternate feet so that the right foot passes over the cones then the left foot passes over the cones. 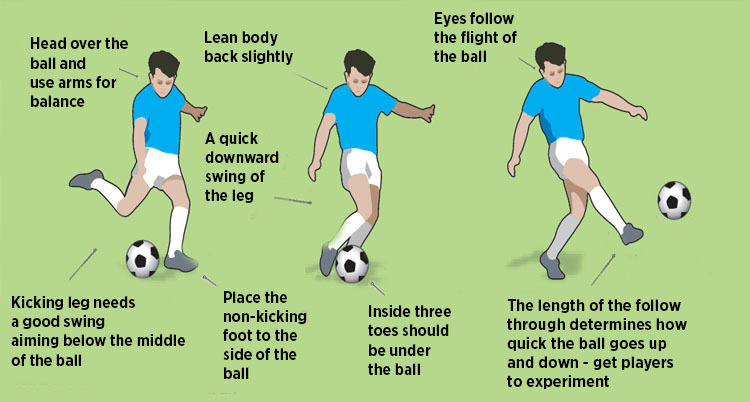 Make sure the players are putting the effort in with both feet – even if it is awkward for them at first.